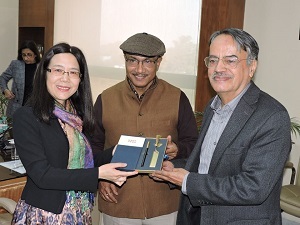 The Vivekananda International Foundation (VIF) hosted a delegation from the Research Institute of Indian Ocean Economies (RIIO), Kunming, China, led by Prof. Zhu Cuiping and comprised of Dr Liu Peng, Dr Li Yanfang and Dr Zhong Ai. The. Dr Arvind Gupta delivered the opening remarks. Discussions were held on the current status of India-China Relations and the way forward, global geopolitics and triangular relationship between India-US and China, India’s Act East Policy and the prospects of India-China economic cooperation. The Chinese delegation reiterated that there were challenges and opportunities in the India-China relations. Although the Doklam episode had negatively affected the bilateral relations, the Wuhan summit has ‘reset’ that. The delegation stated that China’s Maritime Silk Road overlaps with Indian initiatives like the Mausam and the Sagarmala in the region and there is scope for cooperation. They felt that most of the media coverage on bilateral relations highlights the competitive aspects which is not good for the progress of the relations. Positive momentum has been already created by both the leaders which was taken forward by the Special Representative talks and the Hand-in-Hand military exercise in Chengdu. The Indian participants highlighted that since 1980s the bilateral relations have already come a long way. It was not restricted to security issues any more. If we are aiming at ‘strategic partnership’ between the two countries, certain issues like the exchange of maps to define the Line of Actual control, Chinese position on terrorism, India’s membership in the NSG and Chinese intentions about their activities in the Indian Ocean Region and the South China Sea should be made clear and explicit. Then only the bilateral relations can move towards greater trust and partnership. The Chinese participants said that the China and the US are competing in the Indo-Pacific region and in trade. The US wants to constrain the rise of China and hence they started popularizing the Indo-Pacific concept. The US has assigned a key role for India under the umbrella of Quad, according to them. The Indian participants highlighted the fact that often India-US relation is defined from the prism of US-China relations. It is a misconception that the US is an outside power in the Asia –Pacific or Indo-Pacific region; it has been there in the region since the Second World War. Nevertheless, the US-China friction offers India-China relations an opportunity to improve their relations. Indian Prime Minister Narendra Modi has expounded a very pragmatic vision of Indo-Pacific at the Shangri La Dialogue. On Quad, the Indian participants illustrated that it is an evolving concept and much would depend on how China behaves in the coming years. Indian participants expounded that India’s Act East Policy was essentially to meet the economic and strategic requirements of the country and extend India’s outreach to its extended neighbourhood. The policy was started in 1992 after economic liberalization. It is not aimed against any country and predates many of the other initiatives in the region. The Chinese participants highlighted that India and China relations have gone through ups and down but the economic relations are moving in an upward trajectory. There are prospects for more Chinese investments in India. The potential of collaboration should be explored by both sides. The Indian participants raised the issue of the large trade deficit, trade restriction on Indian goods and the pattern of Chinese investments coming to India. They underlined the potential for India-China collaboration in the energy sector, under the Sustainable Development Goal 2015 of the United Nations and other important global challenges.